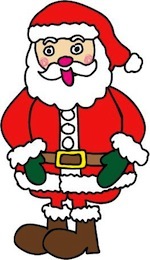 SANTA Song to the tune of BINGO MP3 Download! This song is sung to the tune of BINGO. It's fun, simple and students love it! Lyrics, printable flash cards and teaching ideas below. Click here to download a free mp3 of SANTA! Need help downloading? Read this page. Need more Christmas Songs? Check out our Christmas main page here! Flaschcards: I have made a few simple flash cards to teach the song if you can not show the video to your class. Click here for a printable PDF of flash cards to teach this song. Need more holiday songs? Visit our Christmas Page.